The cap is the bridge between the bulb and the power-source fitting, providing just the right amount of current to make the bulb glow. But one size doesn’t fit all! As there are different types of caps, you need to make sure that they fit your light fixture. Before buying a bulb, make a note of the code on your light fixture, then check the cap code printed on the Philips bulb packaging. There are different types of caps to fit your light fixture because one size doesn’t fit all. Some bulbs are brighter than others as different bulbs produce different amounts of light. 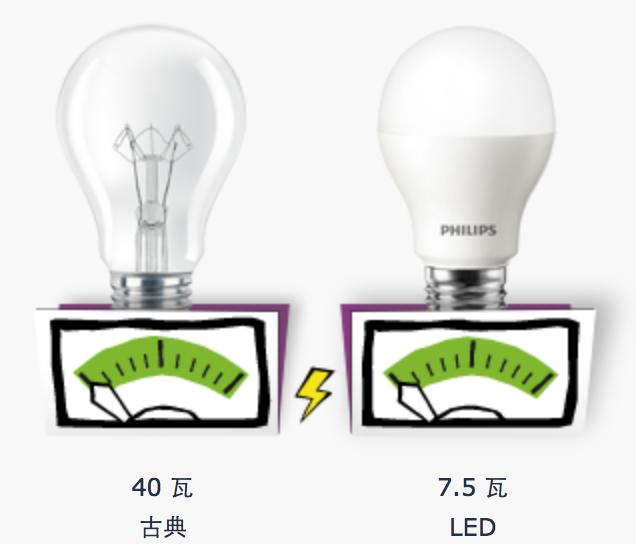 The amount of light is indicated in lumen (lm) and depends on the bulb’s technology and power consumption – or wattage. If you want to know how bright a bulb is, check the lumen value not the wattage. The more lumen a bulb has, the brighter the light it produces. But, the fact that some bulbs are brighter than others doesn’t make them better – it just means they’re suitable for different purposes. Switch cycles indicate the number of times a bulb can be switched on and off before it fails. The room a bulb is being used in can make a big difference to the light bulb’s lifespan. Every bulb can only be switched on and off a certain number of times before it fails. This is known as the ‘switch cycle’. The room a bulb is being used in can make a big difference to its lifespan. For example, bulbs in a living room often stay on all evening, whereas those in a bathroom may get switched on and off much more regularly. So think about which bulb best fits the room you’ll be using it in. Halogen bulbs typically have a switch cycle of 8,000. Energy savers up to 30,000 and LED bulbs about 50,000. Just compare the switch cycles by looking at the switch cycle symbol on our packaging. Watt indicates the amount of power a bulb uses to provide light, while lumen is the unit used to measure the light output of a light bulb. 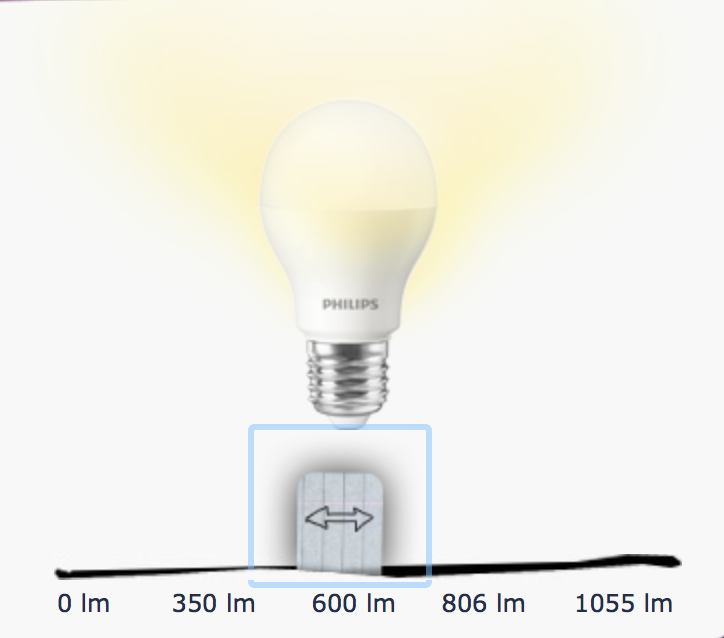 This guide shows how LED and energy-saving light bulbs require less power to emit the same amount of light as a classic bulb and what to look for on Philips packaging. Most people think that the wattage (W) of a bulb tells you how much light it gives. But wattage only tells you how much power a bulb uses. The light output of a bulb is actually measured in lumen (lm). For example, some bulbs, like LED, give the same light output (in lumen) as a classic bulb, but for a much lower wattage. So, to see how bright a bulb is, think in lumen, not watt. The higher the lumen value, the greater the light output. 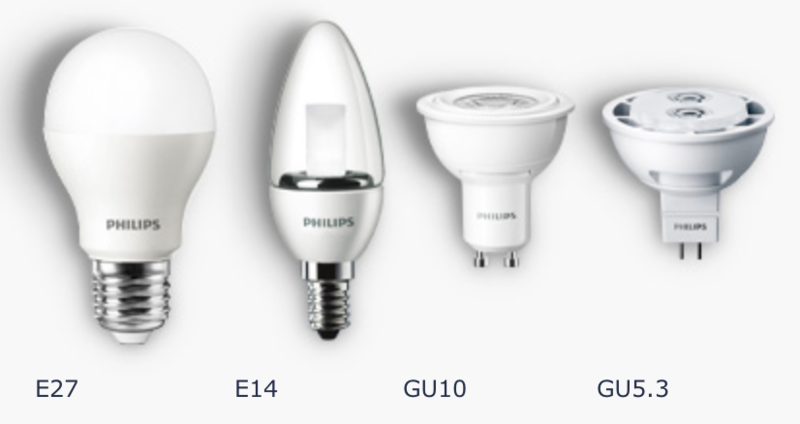 As we know that lumen might be new to you, we want to make it easy for you to find the right replacement bulb. So, on all packaging, you’ll find the ‘new’ wattage value next to the equivalent wattage value of a classic bulb. You’ll also see the light output in lumen (lm). When choosing your bulb you should always keep in mind the width of the area you want to illuminate. This guide shows how the shape of a light bulb determines the width of the light beam. Spotlights and standard lamps can achieve a different distribution of light which is either wide or focused. The shape of a bulb has a big impact on the light effect it delivers. This is because the shape determines the width of the light beam. Standard bulbs can achieve a 360-degree distribution of light. Spots can deliver a focused light distribution at a 25-35-degree beam angle. So keep in mind the width of the area you want to illuminate when choosing your bulb. Color Temperature is indicated in units called Kelvin and its value determines whether light bulbs produce warm or cold light. Light can have different color temperatures, indicated in units called Kelvin (K). Bulbs with a low Kelvin value produce a warm yellow, more cozy light, while those with a higher Kelvin value produce a cool blue, more energizing light. You’ll find the Kelvin value of a Philips bulb clearly marked on the packaging. For some bulbs it takes longer to reach their maximum light output level. LED and halogen bulbs illuminate almost instantly while some energy-saving light bulbs have a much longer run-up time. Some bulbs are faster than others – because they have a shorter ‘run- up time’. 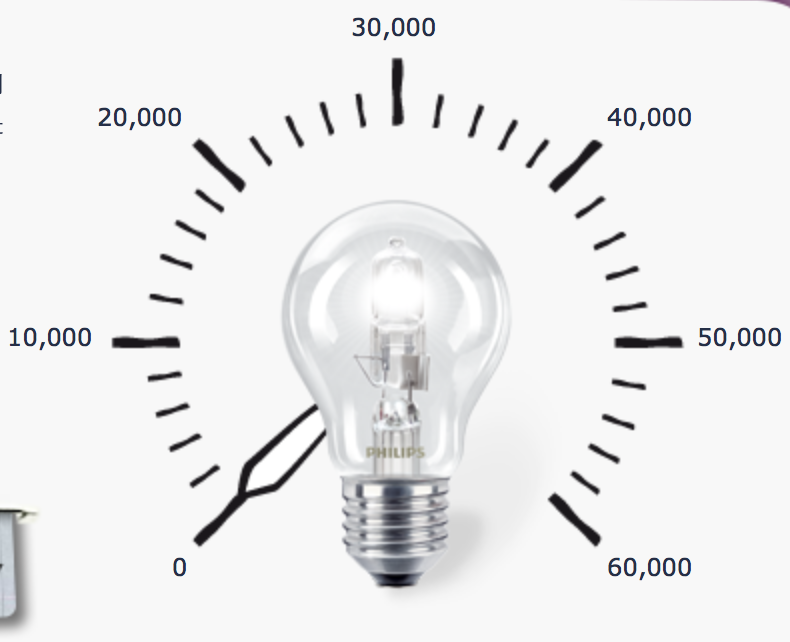 This is how long it takes for a bulb to reach its maximum light output level. Halogen and LED bulbs have the fastest run-up time – of less than one second – for almost instant illumination while some energy savers need 5-30 seconds to reach their maximum light output. The key to bringing your garden to life after dark is to light a select number of trees, plants and other features, to add some dramatic accents. This guide shows you the different ways in which you can use outdoor lighting to open up a new visual window on your garden, so that you can also enjoy it at night. We all have features we love in our garden. But without proper lighting they disappear once night falls. The key to bringing your garden back to life is to illuminate trees, plants and other features to add dramatic accents – and open up a new visual window. Choose the plants and trees you want to accent with light carefully, so they will reveal the unique depth and character of your garden. Then use dedicated garden spike lights to illuminate them from below. Their adjustable heads give you the flexibility you need to angle the light and create the effect you want. Also, consider highlighting other interesting aspects of your garden like water or ornamental features. Enhancing these with light will create new focal points and give you a fresh perspective on your garden at night. Finally, the trick is to draw attention to the features you are highlighting and the light effect, rather than the actual lamps themselves. So try to ‘hide’ these behind plants or other features. We like to feel secure when we come home. So having the right kind of light to welcome us back and get in the front door easily is very reassuring. First, ensure there’s a well-illuminated path to your door, using a series of post lights or recessed spots. Next, light your home’s entrance using bright lights that will make it easy to see your keyhole. Ceiling-mounted lights are ideal if you have a porch or covered entrance. If not, then wall-mounted lights are best. For added convenience, use motion-sensor lights that will turn on automatically whenever you approach your entrance. These will also help conserve power and keep your energy bills low. And, because making a good first impression on visitors begins at your front door – choose lights that express your unique sense of style. Properly lit pathways make it easier to navigate around our homes after dark – and provide us with welcoming, guiding light when we return to them. 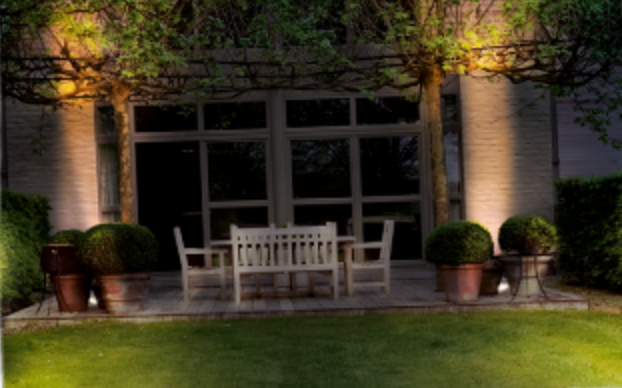 Whether the pathway leads to the entrance of your home, along the side of it or through your garden, there are three great lighting options. Post or pedestal lights are an excellent and stylish choice for lighting pathways with space along their sides. 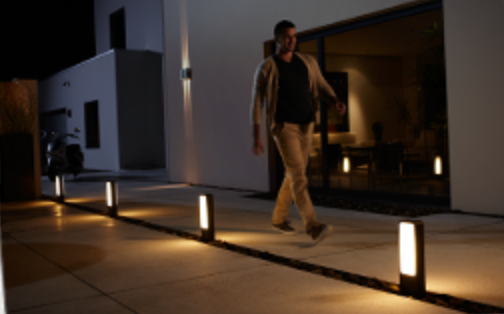 Simply position them at regular intervals along the edge of your path – and they will provide you with the angled down-lighting you need to illuminate the way. If space is tight – or you simply prefer a different style – then recessed spotlights in the path itself are another excellent option. Again, simply install them at regular intervals, to provide up-lighting that will help you easily find your way. Finally, if space is limited on the ground then exterior wall-mounted lights are another great alternative. Depending on the length of your path, simply install one – or a series of them – along a wall to provide guiding light from above. For added convenience, you can also choose motion-sensor wall lights – or other lights connected to stand-alone sensors. These turn on automatically when you approach, giving you light only when you need it. They then automatically turn off afterwards – to conserve energy and keep power bills down. Turning into a well-lit driveway at the end of a long day gives you a real feeling of arriving home and provides your visitors with the guiding light they need to feel truly welcome. There are several very effective ways to light your home’s driveway to make it easier to navigate and park your car. 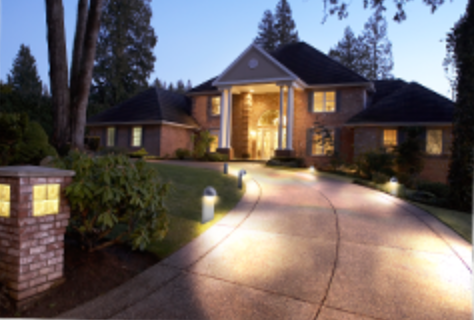 Recessed spotlights installed in your driveway itself will provide you with excellent guiding light. Simply position them at regular intervals to mark either the perimeter of your driveway – or a desired route to your garage or parking places. Post or pedestal lights are another excellent option. 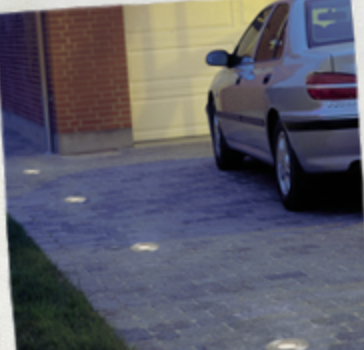 These direct light downwards onto your driveway to illuminate a clear route. They’re especially useful for defining the border of your driveway – and clearly marking the boundaries of tight entrances. 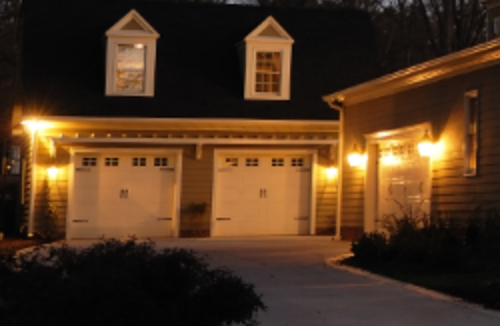 Finally, you can also use wall-mounted motion-sensor lights – or other lights connected to stand-alone sensors – around your garage or parking spaces. These automatically turn on when you approach to make parking and finding your way to your car easy. They will help keep your energy bills down too. The right kind of lighting can transform your patio into an extension of your living room in the evening too, so you can enjoy it night and day. This guide shows you how to combine three different types of outdoor lighting to light your patio perfectly and create a cozy mood for all the different things you want to do there. Your patio can feel like an extra room on long summer days. The right kind of lighting can transform your patio into an extension of your living room in the evening too, so you can enjoy it night and day, whatever you want to do there. The key to creating a perfectly lit patio is to combine three different types of lighting. 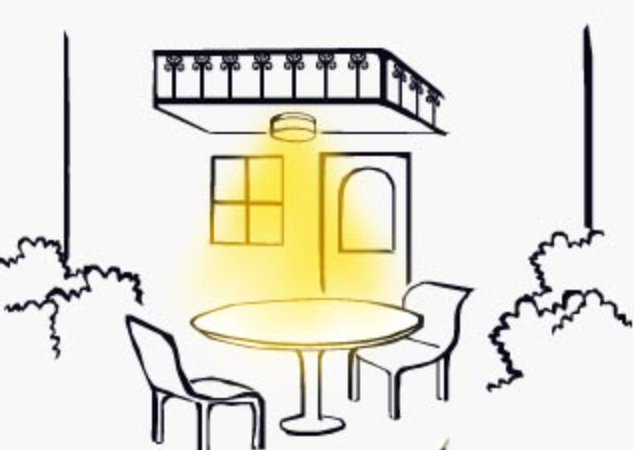 First, use general lighting to illuminate your terrace from above. If you have a covered patio then ceiling-mounted lights can highlight this architectural feature. If not, then exterior wall-mounted lights with motion-sensors will give you the added convenience of instant light, whenever you step outside. Next, choose the right task lighting to support everything you like to do on your patio. A hanging lamp above your garden table will give you the perfect functional light for eating outside, playing games – or even reading. Finally, create a more intimate atmosphere on your terrace with LED CandleLights. These portable, outdoor-safe lights perfectly mimic the flickering glow of real candlelight, but won’t blow out and have no open flames. Place them anywhere to set the perfect mood. Philips LED LightStrips offer an easy way to enhance your home lighting with white or colored light accents. The different ranges provide several design possibilities and can transform the whole mood in a room. This guide shows you where to place and how to use Philips LED LightStrips to accentuate the objects you love. Philips LivingColors can change the way a room looks and reflect the way you feel there. Philips LED LivingColors enable you to play with colored light throughout your home, creating special moments and almost any mood. This guide shows you how Philips LED LivingColors create the perfect ambient lighting by offering a great diversity of lighting possibilities to suit every mood you can imagine. Unleash your creativity with Philips LED CandleLights and TeaLights and create a beautiful candlelight atmosphere the safe way. This guide shows how to arrange Philips LED CandleLights and TeaLights around your home to create interesting light effects and provides tips how to integrate them into your outdoor lighting.